Let’s discuss what a wall cloud is and what a wall cloud isn’t. Often, we see a lot of comments on social media where people incorrectly identify a number of storm features as wall clouds. A wall cloud (or pedestal cloud) is a large, localized, persistent, and often abrupt lowering of cloud that develops beneath the surrounding base of a cumulonimbus cloud and sometimes forms tornadoes. It is typically beneath the rain-free base (RFB) portion of a thunderstorm, and indicates the area of the updraft within a storm. Rotating wall clouds are an indication of a mesocyclone in a thunderstorm; most strong tornadoes form from these. However, many wall clouds do not rotate. Wall clouds are formed by a process known as entrainment which is when an inflow of warm, moist air rises and converges, overpowering wet, rain-cooled air from the normally downwind downdraft. As the warm air continues to entrain the cooler air, the air temperature drops and the dew point increases (thus the dew point depression decreases). As this air continues to rise, it becomes more saturated with moisture, which results in additional cloud condensation, sometimes in the form of a wall cloud. 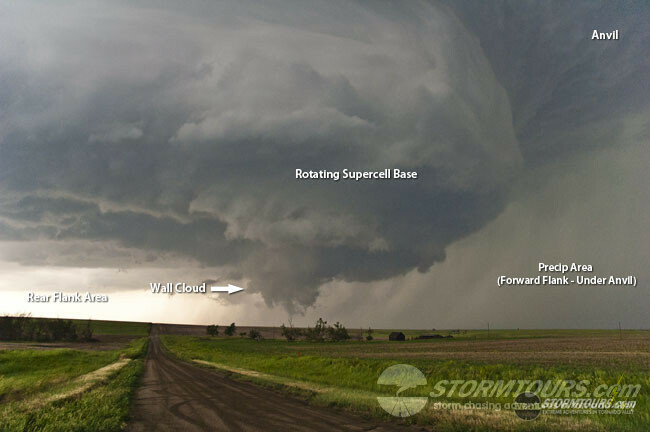 Wall clouds may form as a descending of the cloud base or may form as rising scud comes together and connects to the storm’s cloud base. When we intercept storms, we will typically attempt to view the storm from the south-southeast side and look west-northwest. This is because the storm is tracking (usually) to the northeast. The south-southeast position plots our course just outside of the storm’s intended path, while allowing us to have the best viewing position and contrast when looking at the storm with the western sky, where the late afternoon sun is coming from. However, in HP supercells, it is sometimes necessary to get between the precipitation area of the forward flank and the base of the storm. This allows us to look back into the “notch” of the storm when the base is wrapped with rain. In such cases, it would be the only chance of viewing a tornado. The base of the thunderstorm is usually flat on the bottom, however it extends down from the thunderstorm, thus, people sometimes incorrectly call this a wall cloud. A shelf cloud on the other hand, is a long “shelf like” feature that happens after a storm becomes outflow dominant, meaning that the scales of balance between inflow and outflow have shifted to the outflow and thus the storm no longer has a food source of deep moisture – it is no longer intensifying. The “tower” that makes up the mesocyclone begins to collapse and as it does so, the storm pushes cold air out towards the ground. This is called outflow. When you feel the temperature drop 10 degrees or more within a very short period of time, it’s a good indication that the storm is dying and a shelf cloud is forming. Hopefully this article has helped you learn more about storm types and storm structure. Knowing “where to look” at a storm is the most important part about storm observation. A lot of beginning observers pay a lot of attention to the precipitation area of a storm, under the anvil along the forward-flank; but there isn’t much there to look at other than rain. With the proper position on the storm, you’ll be able to observe the storm’s base and, with time, be able to identify the many features of storm structure. If you can see the base, look for signs that the storm is lowering or look for clouds to just “magically” appear out of thin air (these are called “scud” clouds). These signs are indicative of wall cloud development. If a wall cloud does develop, pay close attention to it for signs of rotation, as this is what creates tornadoes. As a participant during our storm chasing tours, you’ll get the first-hand opportunity to learn about these storm types while storm chasing with our expert team who can answer your questions while viewing real storms and make you a much better storm observer.